Are you still using the WiFi password that is written on the back of the router your ISP gave you? If so, it’s probably some really long combination of letters, numbers and symbols that you can never remember. Most people try to write the password down somewhere or simply check on the router every time they need to give it to someone else. 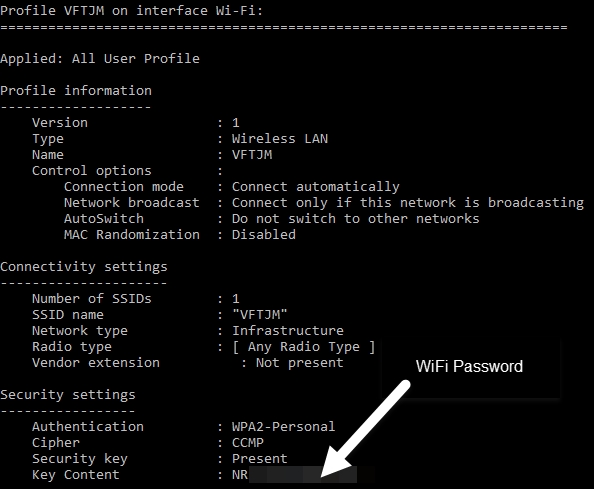 Luckily, if you already have a computer connected to your WiFi network, you can easily view the password there. 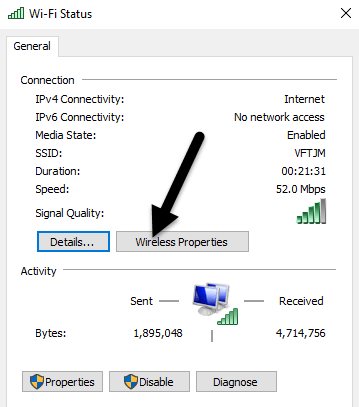 In order to view the WiFi password on your Windows machine, you need to make sure you are already connected to the WiFi network or have previously connected to the WiFi network. If so, then go ahead and right-click on the WiFi icon in the system tray and choose Open Network and Sharing Center. Now go ahead and click on Change Adapter Settings in the left-hand menu. Find the icon for Wi-Fi, right-click on it and choose Status. 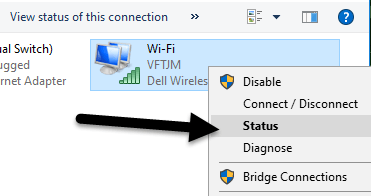 This will bring up the WiFi Status dialog where you can see some basic information about your wireless network connection. 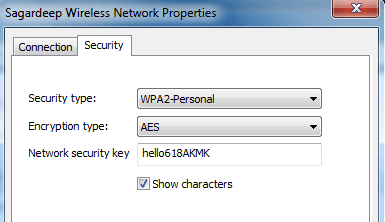 Click on the Wireless Properties button and then click on the Security tab. Here you will see a text field called Network security key. 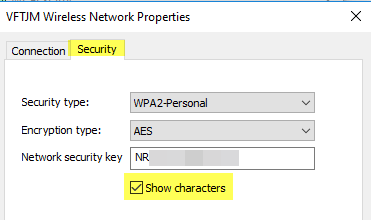 Go ahead and check the Show characters box and you’ll now be able to see the WiFi security password. Note that this is just the WiFi password of the currently connected WiFi network. What if you want to see the WiFi passwords for WiFi networks that your computer previously connected to? Luckily, that’s pretty easy too in Windows 7. In Windows 8 and 10, you have to use the command prompt, which is pretty annoying. 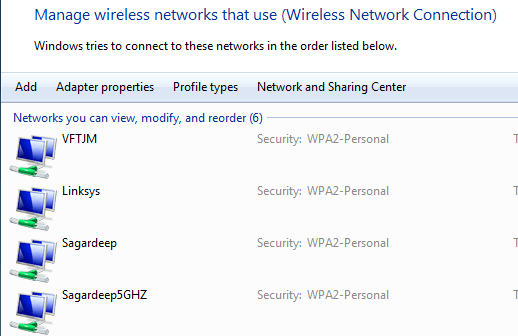 Anyway, in Windows 7, open the Network and Sharing Center and then click on Manage Wireless Networks. You will now see a nice list of all the wireless networks that computer has ever connected to. Just double-click on the one you are interested in. Then just click on the Security tab and check the Show characters box again to see the password. 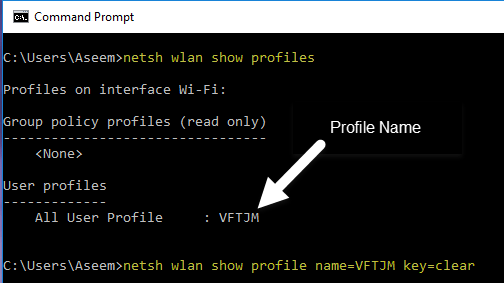 "netsh wlan show profile name=profilename key=clear"
Go ahead and replace profilename with the actual name of the WiFi network listed from the previous command. In my case, the WiFi network is named VFTJM. You do not need to use quotes anywhere in the commands. When you run the second command, you’ll get a lot of output, but you are only interested in finding the line that starts with Key Content. To the right will be the WiFi password.